Calibration Standards - ab-precisons Webseite! We offer a series of Off-The-Shelf Calibration standards for Resistance, Capacitance and Voltage. Please contact us for any needs of Customized versions or Full-Custom Standards. The RS1 is a cost efficient resistance standard in a sealed enclosure, intended for the calibration and verification of precision multimeters in laboratory, research, metrology and educational applications where a precise, yet economical resistance standard is needed. It is available in four versions, calibrated to different accuracy levels, most compliant to ROHS. The resistors used are high accuracy, low drift metal film, wirewound or hermetic foil types, depending on the accuracy level desired. A PT100 temperature sensor is included for precise temperature measurement of the resistors. The economy (-E) version uses metal film resistors and is focussed on lower accuracy applications such as e.g. 5.5 digit multimeters, educational purposes or similar. The advanced version (-A) and the precision version (-P) use wirewound and film resistors with different grade TCs, allowing for lower thermal and aging drift, and are e.g. intended for 6.5 / 7.5 digit DMMs. The precision (-H) version is based on hermetic, oil filled metal foil and film resistors with extremely low aging and temperature drift, for use as a secondary standard together with the most precise DMMs. The -E, -A and -P come with standard binding posts, the -H with gold plated Tellurium Copper posts for lowest EMF. Calibration is based on highly precise DMMs and precision temperature-controlled resistance standards. Calibration data is shipped with every item. The value of these items lies not only in the components used but also in the calibration and documentation applied. Besides the standard versions, custom resistances can be made available, as well as versions with other connectors. Please contact us. Gross prices include 19% VAT. Please note that non-ROHS products cannot be shipped into EU countries. 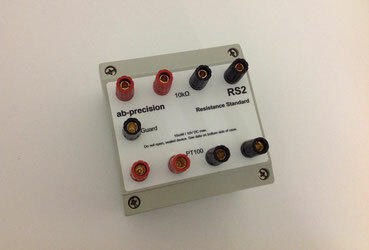 The RS2 is a cost efficient and highly stable secondary resistance standard in a sealed enclosure, e.g. intended for the calibration and verification of precision multimeters in laboratory, research, metrology and educational applications where a precise, yet economical resistance standard is needed. The resistor elements used are high accuracy, low drift, hermetic oil filled/ceramic types with additional pre-aging. A PT100 temperature sensor is included for precise temperature measurement of the resistor element. The RS2 comes with gold plated Tellurium Copper binding posts for the resistance standard element to achieve lowest EMF voltages. For detail configurations and order numbers please see the datasheet. Calibration is based on highly precise resistance standards traceable to National Standards. A calibration report is shipped with every item. The value of these standards lies not only in the precision components used but also in the calibration and documentation applied. 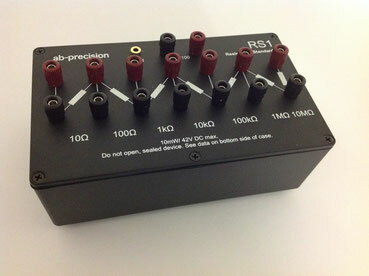 Besides the standard versions, custom resistances can be made available, as well as versions with other connectors. Optionally it is possible to perform a thermal calibration of the resistance standard. Although the thermal coefficient of the RS2 is extremely low, this makes sense if highest accuracy is required and if the thermal environment in the desired application is not stable. This option is supported by the fact that the resistance element, other than with many competitive products, can be measured with a low uncertainty PT100 sensor. 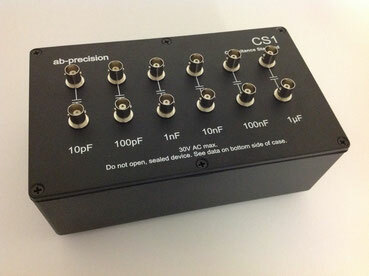 The CS1 is a cost efficient coxial capacitance standard in a sealed enclosure, intended for the calibration of precision capacitanc / LCR meters in laboratory, research, metrology and educational applications where a precise yet economical capacitance standard is needed. It is available in three versions (-S, -P, -H), with a basic accuracy (deviation from nominal) of 5%, 1% or 0.1% (10pF higher), calibrated to an uncertainty of 0.2%, 0.05% or 0.02%. The capacitors used are high accuracy, low drift types. Calibration is based on high precision capacitance bridges. Calibration data is shipped with every item, specifying C and D values for each capacitance. Besides the standard versions, custom versions are possible. Please note that non-ROHS products do not ship into the EU. The DVR1 is a very cost efficient, yet precision voltage reference assembly, capable of generating three precise and low-drift, buffered reference voltages of 10V (single voltage version) or 10V, 1V and 0,1V (triple voltage version). It incorporates a temperature-controlled oven to stabilize the output voltages, thus limiting the impact of ambient temperature fluctuations and is e.g. intended as an OEM product to be incorporated in equipment where precise reference voltages are needed. It may also be used to build up a lab voltage reference. The use of burried zener diodes in hermetic package in combination with other low drift components and a precision temperature control circuitry is the prerequisit of precision voltage standards. This reference uses pre-aged components and a smart design, achieving high accuracy and low drift rates at a very attractive price/performance ratio. 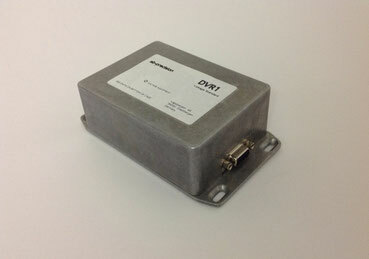 A PT100 temperature sensor enables monitoring of the internal reference temperature. Every product is factory calibrated, traceable to National standards against a precision voltage standard with low uncertainty after a minimum of 500 hours of pre-aging for the references and an additional 100 hours for the complete unit. The calibration includes the adjustment of the 10V output and the precision measurement of the 1V and 0.1V output (for the tripple voltage version). The single output version supports 3 buffered outputs with 10V each. The unit is accompanied by factory calibration data. Custom versions can be made available, please contact us. Please note that non-ROHS prodcuts do not ship into the EU. -Information subject to change without notice. -The use of our products in applications where any failure of such product, in whole or in part, could result, whether directly or indirectly, in personal injury or death of persons or property damage, is strictly prohibited. Applications where the malfunction of the product could result in defects of volume production items is prohibited. Products that we calibrate are not cerified to comply with, nor do we claim to comply with the requirements of ISO/DIN or DAkkS calibration or the like. The use of these products for applications requiring such compliance is therefore prohibited. -If you need a product with calibration per DIN/ISO/DAkkS we can supply this to you, please contact us. Our Mission is to Provide Cost Effective Precision Measurement and Calibration Solutions for Industrial, Scientific and Educational Applications.